This is a problem set designed to be used in an introductory or advanced petrology course, either as an exercise in conjunction with a laboratory assignment or as a stand-alone assignment. It could also be easily modified to be suitable for an exam exercise. The problem set uses field data to help teach the determination and balancing mixed-volatile reactions and locating isograds in siliceous dolomites in a contact aureole. Concepts explored in the problem set can be used to establish a framework for later discussions of T-X(CO2) diagrams, fluids in contact aureoles, and thermal gradients in the crust. Note that mapped assemblages have been somewhat simplified from the field data (Roselle 1997). Where brucite was observed in the aureole it has been mapped as periclase. All of the assemblages are '3-phase' except for the mapped assemblages of Dol+ Qtz+ Cal+ Tr. This assemblage can be the focus of a question regarding crossing tie-lines and the 'quartz-out' isograd. To simplify the exercise the open triangle symbols can be filled, making the assemblage Dol+ Cal+ Tr. Any of the questions below can be made a bit more straightforward by including more guiding text (or the reverse), depending on the preparation of the students. The Ubehebe aureole is an excellent locality to use to teach metamorphic reactions in siliceous dolomites (Peck, 2003), and has the advantage of the availability of supplementary data for other exercises (mineral textures, Roselle, 1997; Roselle et al., 1997; stable isotopes, Roselle et al., 1999; remote sensing, Kozak et al., 2004). 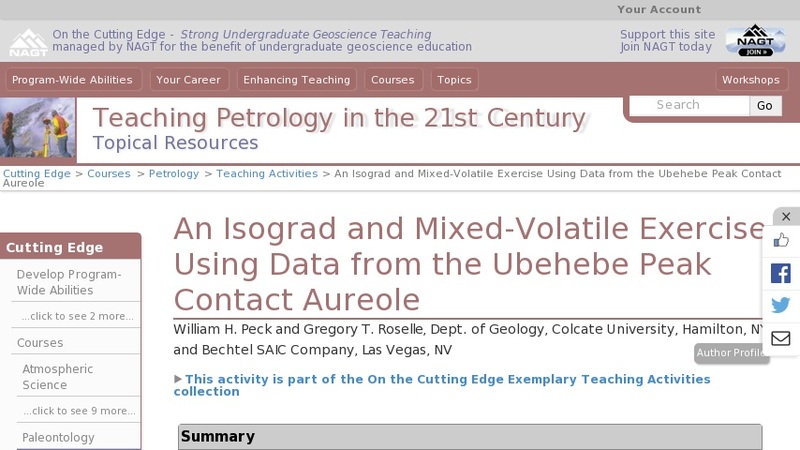 Ubehebe is also a case study discussed in Best's Igneous and Metamorphic Petrology (2003). Winter's (2001) textbook discusses the Alta contact aureole. A similar problem set could be easily made by using data from Alta (Cook and Bowman, 2000).